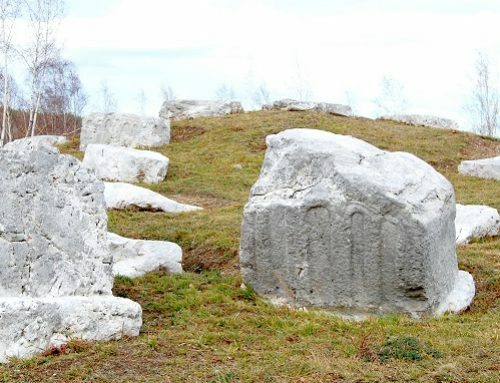 The necropolis is located 7 km west of the necropolis in Perućac (28) and 19 km from Bajina Bašta. The village Rastište can be reached through the canyon of the Derventa River which flows into the Perućsko jezero (lake) in the Drina River basin. Two necropolises with stećci, 500 meters beeline apart, are located north of the village church. About 500 meters to the west of the graveyards with stećci, there is the local quarry Vagan where the tombstones were cut out in the Middle Ages. This anecdotal information was confirmed as accurate following the sedimentary petrographic analysis. The quarry is active, and according to the anecdotal evidence, one partially dressed unfinished stećak – a gabled roof tombstone with a base – has been preserved, but now it is hardly noticeable. 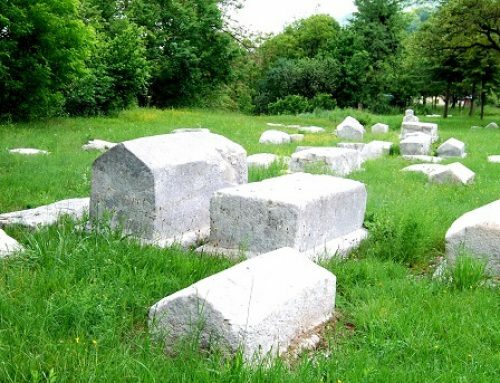 In the area of Uroševina, 33 tombstones have been preserved: 16 gabled roof tombstones, 1 double chest, 12 chests, 1 slab, 2 amorphous monuments and 1 cylinder. The tombstones are oriented west-east, with turns to the north and south and arranged in rows, as well as in the north-south direction. Their surface was carefully carved and polished. The relief decoration was noted on four gabled roof tombstones: circular bulge, bow and arrow and swords. The necropolis at Gajevi is cut across by the recent village road to the quarry. A total of 35 tombstones have been preserved: 26 chests, 2 gabled roof tombstones and 7 slabs. They are oriented west-east, with turns to the north and south and arranged in rows. Their surface was carefully carved and polished. The relief decoration was found on three tombstones: two chests without base bear the motifs of a crescent moon and a cross with three arms that end with a circle and a motif of a crescent moon and a circle inside the lunar bow; the gabled roof tombstone on a base has a plastic representation of a crescent moon and a circle inside the lunar bow. No inscriptions have been recorded. No findings from earlier epochs were recorded in Rastište. The cemetery in the area of Gajevi was formed on a rocky elevated terrain and it is older than the cemetery in the Uroševina area. The Gajevi stećci are mostly slabs or low chests which were obviously cut and decorated in a uniform way. The tombstones at Uroševina include chests and gabled roof tombstones with a base. Change in historical and social circumstances is reflected by the orientation of a number of tombstones, approximately north-south, occupying the western end of a series of tombstones that lie east-west. These monuments are differently dressed than the ones at Gajevi and decorative motifs are rare and represent only weapons. The territory of Bajina Bašta, which includes today’s Perućac, was located at the outskirts of the medieval Serbian state of Raška at the border with Bosnia during the period from the 13th to the 16th century. The population lived in small settlements and communication among them was controlled from fortified towns, today’s sites of Solotnik, Đurići and Rogačički vis. In the 14th century, the region was ruled by Nikola Altomanović and soon the territory was occupied by prince Lazar Hrebeljanović. Spiritual and religious influence was exerted by the monks from Rača Monastery which had been built in the early 14th century. The current settlement of Rastište was established in the 19th century in the wider surrounding of the medieval cemetery. Following a division of the land, burials of one family continued for a short period of time at the site of Uroševina, while these graves are marked by a series of stones. A country road extending along a steep mountain slope makes the north boundary. The southern boundary is a natural slope of meadows stretching to an asphalt road and the left bank of the Derventa River. In the east, the border is a natural slope with a forest stretching to the church and a country road. The west border is a country road and a stream that runs along the village quarry. The necropolis Mramorje in Rastište is located 7 km west of the necropolis in Perućac (28) and 19 km from Bajina Bašta. Two necropolises with stećci, each within 500 metres beeline, are located north of the village church. The medieval cemetery preserved its original structure. Changes that occurred over the last two centuries did not affect the state of the medieval cemetery with stećci. The present state of the medieval cemetery is good. The necropolis at Gajevi is cut across the western part by a village road to the quarry, and five monuments were relocated. The road is paved, but exclusively local in nature. The first phase of clearing off activities was completed in the summer of 2012. Young oak trees in the cemeteries with stećci were attended, and stumps and roots were extracted wherever possible. Soil around each monument was removed. Even the monuments that had not sunk into the ground were covered with earth and grass and weed vegetation. The monuments were cleaned and washed, removing the layers of moss and lichen. No chemical substances were used in the process. The signpost and information boards were placed at the site. 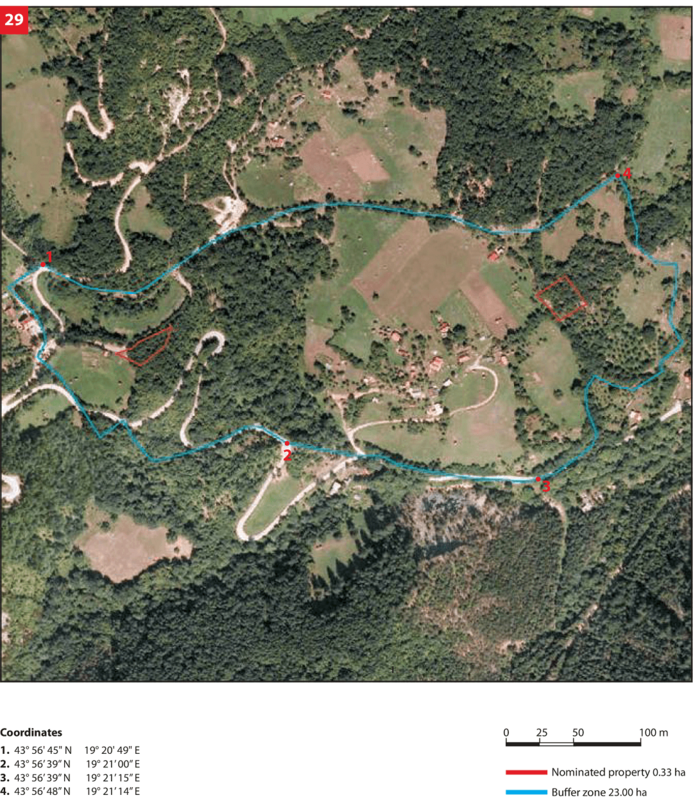 Complete documentation on found and present state has been prepared for the archaeological site Mramorje in Rastište. There are no statistical data available on the number and structure of visitors. Although this medieval cemetery with the stećci is located just above the village in an area of exceptional natural and landscape characteristics, it is not known. It is practically not visited at all. 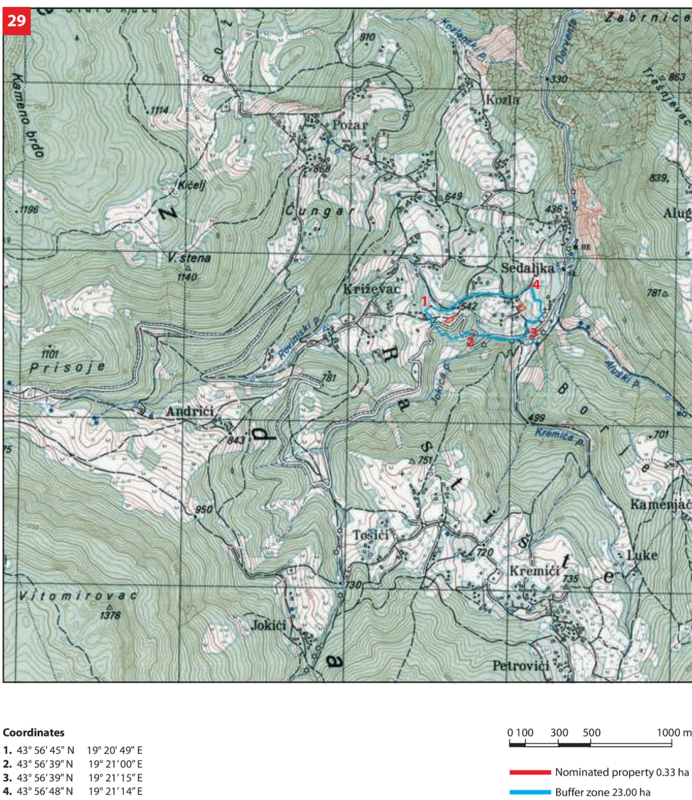 There is an unmarked natural walking trail. There are no signs posted along the road, nor are there any markings or info boards at the site. There are no benches for resting, parking lot or sanitary facility. The site is not included in the itinerary of the Tourist Organisation Bajina Bašta, and there is no information material. Some 10 km out of Rastište by paved road, there is a tourist destination called Predov krst (Predo’s Cross) with organised tourist facilities, regulated and marked hiking trails and a lookout point. In the village of Rastište there is no organised accommodation for visitors, which however, exists within a range of 5 to 30 kilometres, given that the Tara Mountain has very developed both private and organised tourist capacities. There is a possibility of introducing information materials on medieval cemeteries with stećci through the existing hotel and private accommodation capacities.